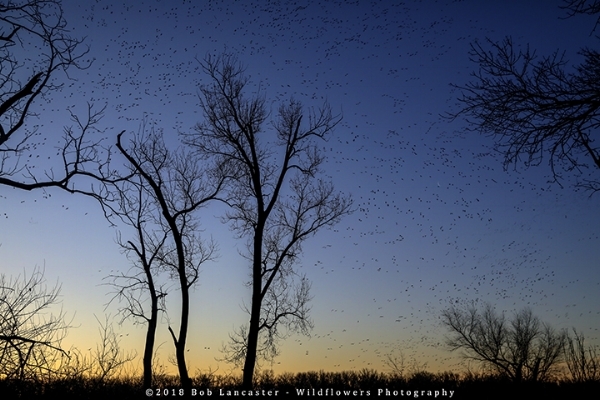 Renee and I took off Monday morning for Desoto Bend Wildlife Refuge near Missouri Valley, on the west edge of Iowa. I had not been there in twenty plus years. A photography friend of mine told me last week that the snow geese were at the refuge. I contacted the refuge and was told there were between 500,000 and 750,000 snow geese on the oxbow lake within the refuge. We arrived late afternoon, drove around the refuge, took some images, got our bearings (I.e. where will the sun be rising on Tuesday morning). Walked into the visitor center which was closing in a few minutes to see to see if we wanted to come back tomorrow and visit. The alarms were set for an early rise. We grabbed a light breakfast, and walked out to a heavy frost on the car. After scraping the windows, we were off with over thirty minutes to get to the refuge and to a spot I had picked out the afternoon before. It was much colder than we had expected, but as forecasted, the sky was cloudless. We could hear the snow geese long before we could see them. As the sun began to lighten the sky, the snow geese started flying. The four images below are a small fraction of the hundreds of images we took yesterday morning. The first image below, I zoomed in on the snow geese as they were approaching our parking spot. The second image is a wide angle image showing hundreds, if not thousands of snow geese spiraling up into the sky searching for a field for their breakfast. The third image shows the unique groupings that occur with the snow geese, a group flying towards the north and a group flying west, at different elevations. The fourth image was taken just a few seconds before the sun broke the horizon. The moon was still visible and the sunlight was reflecting off the bottoms of the white feathered snow geese. We had an amazing time in the refuge, long before anyone else arrived. We returned to the motel, cleaned up, and went back to the visitor center before heading home. At the visitor center we saw and read about a steamship called the Bertrand, that sank in 1865 and was discovered buried on the refuge in 1968. Over 250,000 artifacts were excavated from the wreck the following year.